Why all is not quite what it seems in Moscow-Bishkek relations. In terms of English-language coverage out of Eurasia, the Guardian’s New East platform is one of the more welcome recent developments, especially as a means of cobbling different, disparate outlets and voices under the same umbrella. There have been hiccups and growing pains, as can be expected, but by and large it works well. The visuals are clean. The navigation’s quick. The specs are, on the whole, on-point. However, a recent offering on Russia’s influence on Kyrgyzstan’s policies was a marked glitch in an otherwise strong vertical. The premise isn’t off – from security to energy, from cultural output to foreign policy focus, Russia has come to direct Kyrgyzstan’s geopolitical trajectory more than any other external benefactor. Russia has tightened control over Kyrgyzstan. That much isn’t in much dispute. The reasons and rationale cited in the piece, however, come off as misinformed, and blur facts on the ground with what’s no longer true. The piece pivots around three points – Gazprom’s recent push into the Kyrgyz gas market; Rosneft’s attempts to take a controlling stake in Manas; and Moscow’s push to cement Kyrgyzstan within its Eurasian Economic Union (EEU). All of these have a kernel of truth in Moscow-Bishkek relations, but the piece bungles the delivery and reality of each. 1. Gazprom has taken a controlling stake in Kyrgyz gas. This is, technically, true. On April 10, Gazprom took a controlling stake in Kyrgyzgaz, shelling out all of a dollar (and forgiven debt) to grab control of the national gas matrix. An external quasi-state actor had managed to gain a chokehold on Kyrgyzstan’s internal energy security; Russia had, indeed, tightened control over its former colony. And to its credit, the Guardian piece lands this detail correctly. So, yes, Russia may have gained Kyrgyzgaz – but it’s also helped wring one of the greatest energy crises Kyrgyzstan has yet known, a detail the Guardian piece fails to convey. Casey Michel is a graduate student at Columbia’s Harriman Institute, focusing on post-Soviet political development. He can be followed on Twitter at @cjcmichel. 2. Rosneft is also making steady inroads into the Kyrgyz market, allowing Russia that much greater role in directing the country. The Guardian piece conveys the notion that Russia’s other energy behemoth, Rosneft, has implemented also successful designs of its own in Kyrgyzstan. “Rosneft,” the piece reads, “…also signed a deal in February this year to invest up to $1bn for a stake of at least 51% in Manas International Airport.” Much like the national gas lines, it looks like Russia is about to snap up the country’s main air infrastructure – another chokehold held over a reeling Kyrgyzstan. It’s a nice notion – but the claim that Rosneft is landing a controlling stake in Manas is completely incorrect. Now, to be fair, it looked like Rosneft was set to bring Manas into its fold. This was the assumption, for much of the first half of 2014. And then, over the summer, the reality changed. As sanctions began rumbling through Russia, China’s Beijing Urban Construction Group announced that it had swiped Rosneft’s planned purchase, with a separate Chinese corporation looking to lead refurbishment efforts in Kyrgyzstan’s second-largest airport. The reasoning for the shift remain murky – the Rosneft veto may have as much to do with sanctions as it does with certain payments not yet made public – but for the Guardian to miss this new reality is an unfortunate oversight. 3. 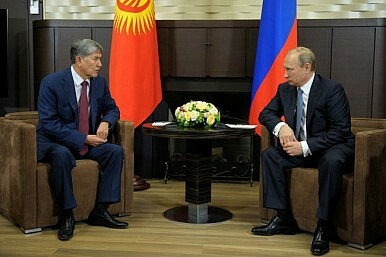 President Almazbek Atambayev said Kyrgyzstan will join the Eurasian Union by the end of the year. This bit – focusing on Kyrgyzstan’s planned involvement in the Moscow-led Eurasian Economic Union (EEU), yet another indicator of Bishkek’s fealty to Moscow – is perhaps not as grievous a mistake as the first few points, but it’s still worth noting that the Guardian overlooks some key aspects of Kyrgyzstan’s purported EEU accession. Not only has Kyrgyzstan pushed back planned accession time and again, but Bishkek has also announced that it won’t be ready to implement all requirements until 2020 – all while still weaning loan after undefined loan from Moscow. Moreover, Atambayev didn’t actually say Kyrgyzstan will join the EEU by the end of the year; rather, he said he hoped they’d be able to. Semantics, perhaps – but a distinction with a difference. Again, to repeat an earlier point, the Guardian’s line of thought isn’t incorrect – Kyrgyzstan fits firmly in Russia’s pocket, at least in the short-term. There should be little dispute around this, and all the more after the United States’ summer departure from its largest foothold in the region. But this geopolitical pull isn’t due to Rosneft’s (nonexistent) purchase of a 51 percent stake in Rosneft, and is in fact hampered by Gazprom’s role in the gas shutoff in Kyrgyzstan’s south. And, as we’ve seen with the Armenian example, assuming any nation will march obediently into the EEU’s fold is a fool’s errand. Bishkek does, indeed, remain firmly oriented toward Moscow – but not necessarily for the reasons stated in the piece. And with Russia’s declining economic appeal, China’s increasing sway, and Kyrgyzstan’s own agency, this direction looks increasingly impermanent. Will Kyrgyzstan Leave the Eurasian Economic Union? First “Brexit” from the European Union, then “Kyrexit” from the EEU? A ‘Blurry’ Union: Kyrgyzstan and the Eurasian Economic UnionNew Hyrdropower Project Partners Needed in KyrgyzstanRussian Intelligence in Kyrgyzstan, Cold War ReduxWhy Kyrgyzstan Should Not Join the Eurasian Economic UnionCan Russia and China 'Synergize' the Eurasian Economic Union and the Belt and Road Initiative?